“Happy” is a song performed by American singer and producer Pharrell Williams from the Despicable Me 2 soundtrack album. It also serves as the lead single from Williams’ second studio album, GIRL (2014). The song was written and produced by Williams. It came out on 21st November 2013, alongside a long-form music video. The song was reissued on December 16, 2013, by Back Lot Music under exclusive license to Columbia Records, a division of Sony Music. “Happy” is a neo soul and funk song on which Williams’ falsetto voice is comparable to Curtis Mayfield. The song has been highly successful, peaking at number one in the United States, United Kingdom, Australia, Ireland, New Zealand, and 19 other countries. It has sold over 1.3 million copies in the United Kingdom, and has reached No. 1 on the UK chart on a record three separate occasions. The 24-hour music video for “Happy” was projected at the Buenos Aires International Festival of Independent Cinema in April 2014. The original video spawned many cover videos on YouTube in which people from different cities throughout the world dance to the song. 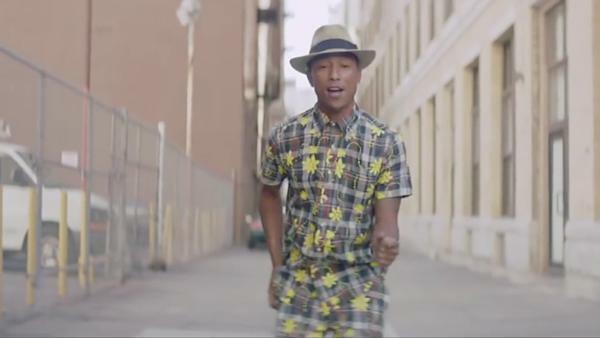 Those videos are usually called “Pharrell Williams – Happy – We Are from [name of the city]”. As of May 2014, more than 1,500 videos had been created. Inspired by this global phenomenon, a French couple launched a website wearehappyfrom.com to showcase the re-makes. Here there is a video with a musicless version of the music video for Pharrell Williams’ hit song “Happy”. They left in some of Pharrell’s actual vocals from the song and then added in silly voices and lyrics for the random individuals who are singing along. Este artículo fue publicado el Miércoles, 2 Julio 2014 a las 2:03	y archivado en la categoría Curiosities, People. Puedes seguir cualquier respuesta a esta entrada a través del canal RSS 2.0. Puedes enviar un comentario, o enlazar desde tu propio sitio.